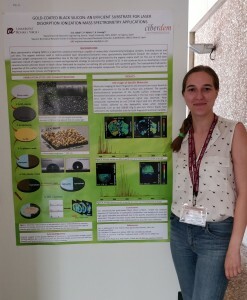 Alexandra is the winner of a Poster Prize awarded for the excellent presentation of particularly significant innovative analytical research on the occasion of the “17th International Meeting on Chemical Sensors” (15-19 July 15-19, 2018, University of Vienna, Austria). The Metabolomics Platform from the Universitat Rovira i Virgili and Ciberdem is seeking candidates to apply for a Postdoctoral position. The MiL@b (Metabolomics Interdisciplinary Laboratory) Research Group from the Rovira i Virgili University is seeking candidates to apply for a scholarship to obtain the PhD at our research facilities located in Tarragona (Catalonia, Spain). MiL@b is a multidisciplinary research group formed by chemists, biochemists, computer and telecommunication engineers that has a very close relationship with the Metabolomics Platform. Nowadays, technical advances have generated a large amount of measurement techniques that can be used to detect, identify and quantify molecules present mainly in biofluids or tissues of living entities like humans. One common characteristic of these systems is the wealth of raw data they generate for each measurement. Converting this raw data into useful information is key to find exciting new applications of these techniques towards the Personalized Medicine envisaged for the 21st century. The goal of the project is to devise algorithms in the fields of biostatistics, digital signal processing, pattern recognition, multivariate analysis and neural networks to be able to process raw data coming from the measuring of biofluids such as serum, plasma or urine with different stablished techniques like NMR, Gas/liquid Chromatography-MS and MALDI-TOF to add relevant clinical information to the metabolomics field. The research group is in touch with many medical teams and has access to state-of-the-art instruments that provide the most advanced characteristics (sensitivity, selectivity, automation, data acquisition handling and storing raw data, etc.). All these algorithms will be developed in open platforms such as R, the gold standard for statistical analysis in biosciences, and will be validated with real samples and real problems that have not been solved until now. We are involved with the Ciberdem institute that can provide all the samples and cases to study and the IISPV. Metabolomics and the techniques that provide the information needed have a bright future in medicine, since the information obtained can be used for early diagnosis through the discovery of robust and significant biomarkers or to assess the efficacy of new treatments. All this work could be included in a new profile of researchers commonly known as “data scientists”, which is today one of the most required positions in a big majority of the scientific fields. Required profile: Candidates should have a background on computer science (very good programming skills), electronics, telecommunications or physics. Experience on statistics or multivariate analysis will also be appreciated. Application: Candidates should apply to Martí-Franqués COFUND Fellowship Programme (position 2018MFP-COFUND-4). The application process is entirely electronic. Deadline for applying to MFP is May 20, 2018. We would be grateful if you also notify your application to Dr. Serena Pujol (serena.pujol@urv.cat), sending her by email your motivation letter and CV. Mass Spectrometry Imaging (MSI), is an emergent technique able to detect and spatially localize proteins, peptides and/or metabolites in animal or vegetal tissues, with excellent lateral resolution and minimal sample preparation. MSI is a truly biomolecular histology technique, that combined with traditional histological techniques, will represent a step forward in many applications such as drug discovery, histopathology, toxicology or food safety, among others. This seminar will focus on the potentiality of the technique, as well as on practical aspects related with sample preparation, mass spectrometry instrumentation, data processing and bioinformatics resources. Live webinar: Dr. Oscar Yanes – “Metabolomics: only suitable for multidisciplinary teams”. 29 Jan 2015. Brought to you by the Early-career Members Network of the Metabolomics Society. Registration: https://attendee.gotowebinar.com/register/2409752719256762369. Download the Flyer. Remarkable quantitative and qualitative differences in HDL after niacin or fenofibrate therapy in type 2 diabetic patients. Xavier Palomer, Manuel V_azquez-Carrera, Josefa Girona, Núria Plana, Francisco Blanco-Vaca. Dr. Noelia Ramírez, PhD on Analytical Chemistry, has joined the Metabolomics Platform as a postdoctoral researcher. Her research is focused on the development and validation of analytical methods for metabolite profiling and biomarkers detection by GC-MS, GC×GC-TOF/MS and MS imaging. She also works onenvironmental metabolomics, especially on thirdhand tobacco smoke characterization and health effects. Dr. Radu Ionestu joined the Metabolomics Platform as a postdoctoral researcher with a grant Ramon y Cajal. Dr. Radu Ionescu is performing research in the field of non-invasive diseases diagnostics, prognosis, and monitoring. He works on diseases profiling and fingerprinting via the analysis of volatolomic samples (volatiles released by different body fluids such as exhaled breath, skin headspace and urine headspace) with analytical chemistry equipment and chemical gas sensors devices. “Development and evaluation of a novel advanced lipoprotein test based on 2D Diffusion-ordered 1H NMR Spectroscopy”. The jury has valued its originality in helping to improve cardiovascular risk factors, the methodological contribution of research and industrial commitment shown by adequate protection of intellectual property and the creation of the spin-off Biosfer Teslab. The suplement “Economia y Negocios” from the Diari de Tarragona, has published a report about Biosfer Teslab last Sunday 2/2/14.